right! i think we’re all agreed here – two classic SRB shows at alberta’s jubilees north and south, respectively. 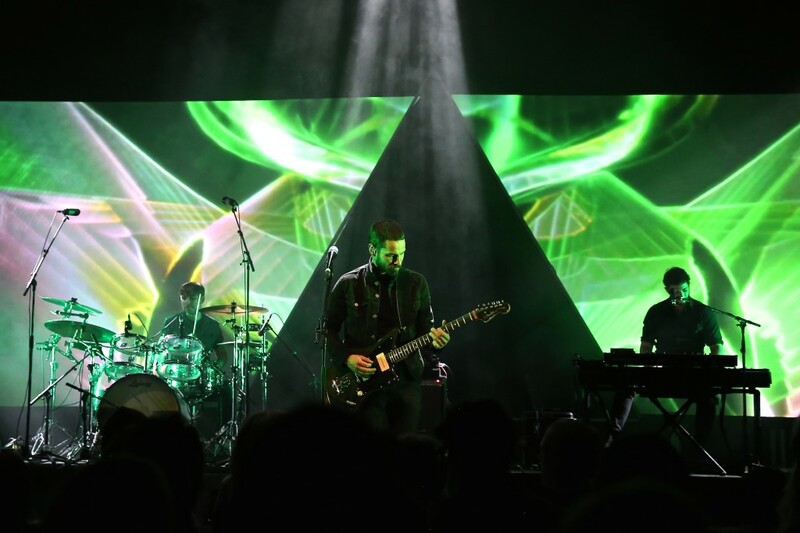 our beloved sam roberts band finally – FINALLY – made lo-fantasy a reality in wildrose country after our long (so long!) and lonely (so lonely!) SRB-less summer. what if we picked a winner in the SRB’s battle of alberta? because there are battles of alberta, y’know. it’s an actual thing here. oilers vs. flames, edmonton vs. calgary. it happens. i don’t know much about hockey, but i know there can’t be two winners. i know the oilers and flames don’t share the cup. i also know if the SRB were a hockey team, i’d totally cheer for them. that is exactly everything i know about hockey. i almost – thisclose! – declared the battle a draw, because you’re my countrymen, my comrades, and i love you both, edmonton and calgary. i’ll admit i struggled for a few days to pick a winner, until i remembered this isn’t about me. i always have the best time ever at SRB shows because i always have the best time ever at SRB shows. i am a sure thing. this is about you, alberta, and you, beloved SRB. 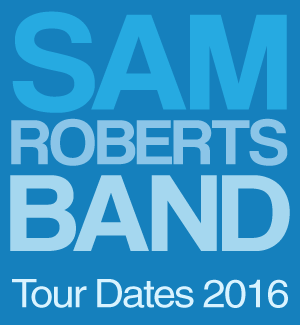 fact: the sam roberts band sold out the jubilee in edmonton. 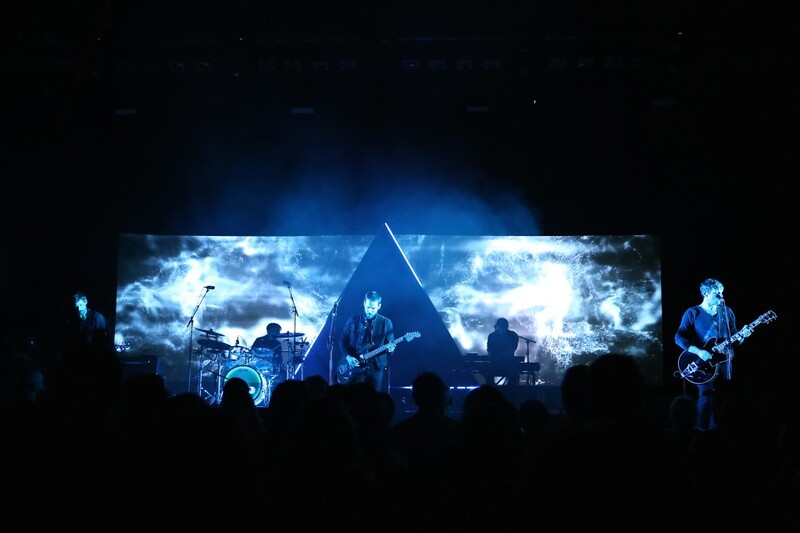 the sam roberts band did not sell out the jubilee in calgary. also, it must be noted the SRB sold out the jubilee in edmonton on saturday night with BOTH fleetwood mac at rexall place, and hometown heroes corb lund and smalls at the starlite room for their much-hyped reunion tour. these are facts, because you deserve the truth. this also happened: the northern jubilee stood from the second the SRB took the stage to the second sam finished the handshakes and high fives of brother down. the southern jubilee needed sam’s permission to stand. edmonton and calgary! you guys are sooooo adorable! and predictable! we do this dance (or not) every. single. time. more truth: we do not have a staff photographer here at the bootleg saint. this is mostly because we have no staff. if we hired staff, we’d definitely ask lisa mueller first. she took all the fantastic photos of the SRB at the northern jubilee, and ever-so-graciously let me use them here. thank you, lisa! speaking of lisa . . . lots (lots!) of devoted, long-time SRB fans at both shows. lots of people who knew the words to all the singalongs, AND lo-fantasy. unsurprsingly, both nights relied heavily on lo-fantasy, and by design lo-fantasy works so beautifully live. the masses have spoken, and they know all the words. people are listening to lo-fantasy, and they’re listening on repeat. live beauty at the northern jubilee: with a bullet. it’s one of my all-time favourite SRB songs and always a highlight for me. flawless visuals matched the SRB’s flawless performance. shapeshifters, angola, metal skin – it’s almost too much. it’s times like these i struggle to make my words. in other news, a couple got engaged in edmonton. i didn’t witness this personally, but it’s becoming more and more common at SRB shows, so i’ll take the reports as gospel. awww moment edmonton: a girl gave her front-row spot to another girl, who desperately wanted to be close to sam, and almost immediately burst into tears. may the girl who gave up her front-row spot be blessed with good karma forever and ever. live beauty at the southern jubilee: that setlist, tho! sam! seriously!!! detroit ’67, up sister, and every part of me back to back (to back)?! minds blown, hearts broken, wow. detroit ’67 works so absolutely perfectly with the rock spectacle of the lo-fantasy tour it should become a nightly staple, because it was definitely a highlight in calgary. aww moment calgary: sam gave his setlist to a pregnant woman in the front row “for the baby” because of course he did. what, did you think he wouldn’t? i worry about you sometimes. 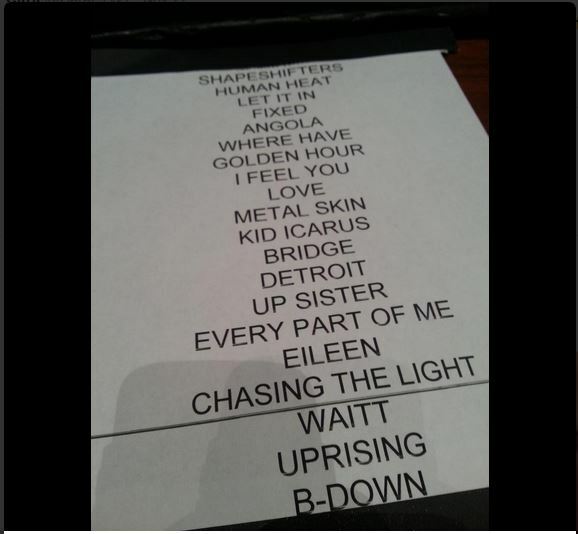 just in case you didn’t believe me, here’s calgary’s setlist courtesy of cara agar . . .
home truths: i have heard much – much! – about kid icarus over the last few days! mostly about the drums. also, much talk about sam’s guitar in uprising down under, and how james plays the synthesizer in chasing the light. if anybody would like to discuss the guitar playing talents of dave nugent at great length, please – call my house. i can’t contribute to these technical talks. “one-note solos, high on the neck, with no mistakes ever,” apparently. that’s probably why i leave every SRB show completely convinced i could learn to play guitar just like nuge, but i think that’s just ’cause he works so hard to make everything look so effortless. pro tip: if you’re like me and can’t be trusted to buy a poster at a concert without destroying it before you get home, don’t worry – you can buy canadian tour posters (also tote bags and shirts) right here. and the winner is . . . edmonton. lit with help from the tragically hip all those years ago, northern alberta’s fire for the SRB burns as strong as ever. you’ve officially won the completely unofficial lo-fantasy battle of alberta, edmonton. let’s keep our fingers crossed we can play this game again in a couple of years. until then, edmonton, here is a treat from the calgary show – it’s every part of me. enjoy! This entry was posted in tour on November 24, 2014 by annie.